Safety is a major concern these days. Everywhere, folks are concerned about their personal safety from an attack, their business’s safety from theft or damage or even their home’s safety from burglary or intrusion. Video surveillance is an affordable and convenient first step in helping to establish a layer of protection. So when someone’s video surveillance is successful in capturing an intruder, what should one do with the video evidence? One home invasion “victim” invited the perpetrator over to visit again any time. Recently in Louisiana, a homeowner was reviewing the surveillance footage from her home’s security system when she noticed something both strange and unexpected: an intruder had entered her garage. This, however, was not a dangerous felon looking for an easy “score”, or worse. The intruder was a little boy. The pint-sized burglar ran into the garage, hugged the homeowner’s dog (attention that the dog seemed to thoroughly enjoy), and ran away before being caught. It turns out, however, that he was caught, caught by the owner’s surveillance system. Typically, the whole point of a home surveillance system is to prevent break-ins, by acting as a deterrent, and to create video evidence of the intrusion in order to catch and convict the offender. In this case, the homeowner took decisive action: she wanted to invite the intruder over! She, however, was unsure the identity of the boy. The young prowler wore a baseball cap and avoided looking at the camera, thus protecting his face and identity! Typically, a video forensic expert could be utilized to enhance the video to try and discern the identity of the invader. In this case, however, it seems that the homeowner did not consider her intruder a threat and instead wanted him to know he was welcome to play with their dog any time. In place of using video enhancement techniques, the homeowner turned to a slightly lower-tech method of identification: social media. While posting a copy of the surveillance video evidence on Youtube, the homeowner made known that she would like to find the identity of the trespasser. 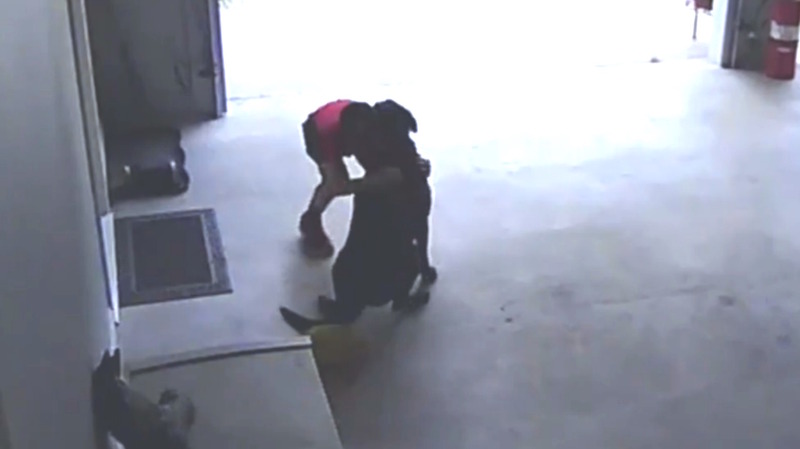 Her goal was not to get the young burglar in trouble, but rather to let him know he was invited to come play with her dog any time. After over a million views, she learned that the boy was indeed her next door neighbor. The boy’s family had a dog that passed away the previous year and he was in need of some four-legged affection. The boy’s family plans on getting a new pooch soon, but in the meantime, he now has regular play dates with the neighbor dog.